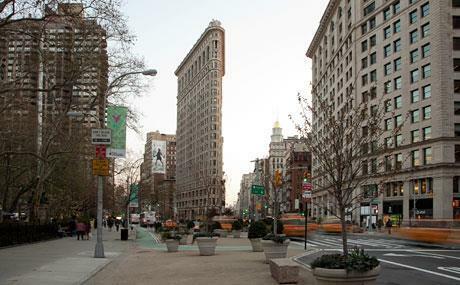 The Flatiron District is within walking distance to Penn Station or Grand Central Station. It is home to many fascinating buildings and people alike. A population of about 30,000. The Flatiron District got its name from the Flatiron Building seen here. The Gershwin Hotel is also in the Flatiron District with a collection of Andy Warhol art in the lobby. Home to Madison Square Park, which is in the north section of town, since its renovation in 2001, has held musical concerts at 7 pm through to August 6th come rain or shine. The 23rd Street Business Improvement District (BID) was formed in 2006 with blessings from the over 80 year old Board of Directors of the 23rd Street association. The goals coming to life have high hopes of enticing commerce back to the Flatiron District. This is the largest BID in New York City with a budget of 1.6 million annually. 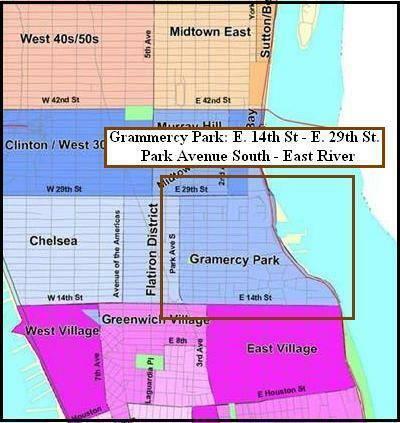 The BID district is an irregularly shaped area of some 38 square blocks, from 21st to 28th Streets, and from parts of Sixth Avenue up to, but not including, Third Avenue. It holds more than 20 million square feet of commercial space and over 4,500 businesses. Between the summer of 2007 and 2008, the district gained 7 new retailers, restaurants, and general commerce.